Interested in tracing your family history . . . but don't know where to start ? 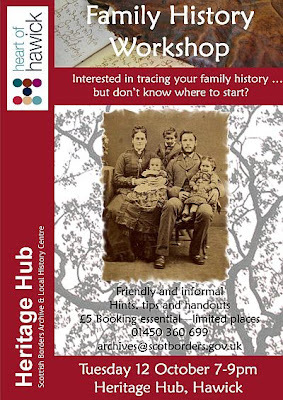 Then come along to a Family History Workshop at the Heritage Hub, Hawick on Tuesday October 12th, 7pm-9pm. They will show you how the resources at the Heritage Hub can help you in your search. As well as the usual census returns, old parish records, and monumental inscriptions, you will have the opportunity to view a range of records including, business records, council records, family papers, militia lists and poor law records. Rachel Hosker, Archive Manager says "Family history is much more than being a collector of names and dates. We hold fascinating and unique evidence covering the whole of the Scottish Borders to help people gain a picture on how their ancestors lived and worked and build up the story of their own family." Places are limited - so do please book early to avoid disappointment – the charge of £5 will include handouts and a family history chart. Phone 01450 360688 or 01450 360699 to book a place. If you need help before October 12th, come along to our free talk, Local Families of Ancient Origin in Foulden, Berwickshire on Sunday, 26th September or get free advice from us, the Hawick Heritage Hub and others at our Family and Local History Fair and Conference in Melrose on 9th October. 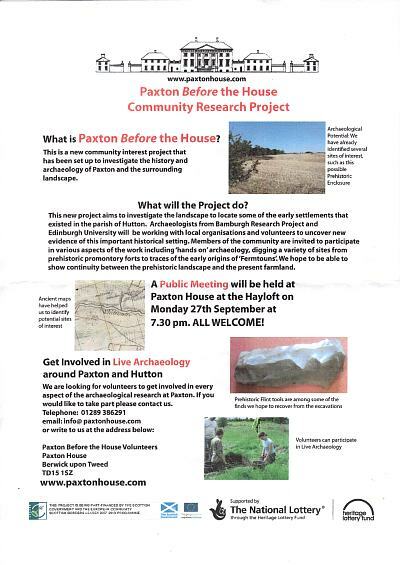 This is a new community interest project that has been set up to investigate the history and archaeology of Paxton and the surrounding landscape. It aims to investigate the landscape to locate some of the early settlements that existed in the parish of Hutton. Archaeologists from Bamburgh Research Project and Edinburgh University will be working with local organisations and volunteers to uncover new evidence of this important historical setting. Members of the community are invited to participate in various aspects of the work including 'hands on archaeology', digging a variety of sites from prehistoric promontory forts to traces of the early origins of 'Fermtouns'. They hope to be able to show continuity between the prehistoric landscape and the present farmland. A public meeting will be held at Paxton House at the Hayloft on Monday 27th September at 7.30 pm. All welcome ! They are looking for volunteers to get involved in every aspect of the archaeological research at Paxton. If you would like to take part please contact them on 01289 386291 or via the Paxton House website. Having taken part in archaeological digs before, my experience was that this is often a very exciting way to spend a few days. Not only does one learn about the generalities of archaeology, there's usually lots of opportunity to learn about the objects found. It's very exciting to unearth historic artefacts, and wonder whether your ancestors made, dropped or sold them. Recently I was contacted by Richard Oliver who is part of a y-DNA project that to establish links between different Oliver lines. If you want to know more about using DNA profiling in general read DNA testing for Genealogy and for a description of a project in the Borders have a look at Elliott (and Border Reivers) DNA Project . Richard says that the participants in this project are mainly from Northern Ireland but some have links to the Borders in the Jedburgh Area. The most recent development has established a link between two groups of Olivers whose common ancestor lived in Northern Ireland or Scotland. Some men in the group have links to either Scotland or Northern Ireland. If you would like to know more about this project either look at their Oliver y-DNA Project web page or send an email to the address on My FamilyTree DNA Project Website. We underestimated the demand for the talks at our forthcoming family and local history fair and conference, so we've moved the talks into a bigger room and allocated more seats to the seat booking site. We will hold some seats back so that those who don't have internet access can still go to the talks, and I expect there will be some people who don't turn up on the day. However, admission to the fair and conference is free, the seats are free, there is no booking fee, and there'll be people from the Hawick Heritage Hub as well as others in our research room waiting to help you with your research. You don't need to bring lunch or drinks with you as we're providing light refreshments at very low prices. Most of these exhibitors have new publications for sale including monumental inscriptions, local history, and social history. If you've joined recently, please do come and speak to us. Reported in the Herald, Martin Davidson, the BBC’s commissioning editor for history, which includes a favourite genealogy programme Who Do You Think You Are?, discovered that his German grandfather, Bruno Langbehn, had been one of the first members of the Nazi party, a high-ranking SS officer, and colleague of the architects of the Holocaust. in business, deserted the family. Should we be scared ? Generally, we can't be held responsible for what our ancestors thought or did, but perhaps we are responsible for what our children do. If genealogy or family history consisted only of creating family tree charts and getting back as many generations as possible, I doubt there would be much of a following; and I think it's finding out more about our ancestors and the times in which they lived that makes family history so interesting. 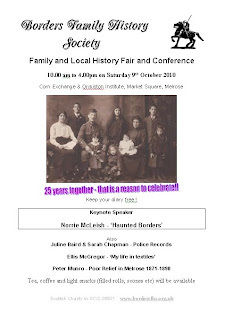 That's why Borders Family History Society has always been keen on researching social history as well as transcribing monumental inscriptions and publishing. Past publications have included foreign births, marriages, deaths reported in local newspapers, Days of Our Youth - Memories of Melrose, Dunse Barony Records (transcription of Court Records), Full of Egotism, the Diary of Rev John Hastie, Edrom, Jedburgh Parish Poor Law Records (1852-1874), Jedburgh Parish Poor Law Records (1875-1893), Kelso Poor Law and Ragged School Records, Melrose War Memorial, The Kirk Yetholm Gypsies. We're working on other publications, Criminal Records, Lunatic Records, Melrose Parish Poor Law Records, Police Records too. However many of these show our ancestors in a very poor light. Recently, I helped a friend research a lady on her family tree who had been committed to a lunatic asylum for striking pictures in her house with a walking stick, however, she wonders whether that lady's descendants fear people knowing that their ancestor had mental health problems. Another record was about a man who had suicidal tendencies, deeply depressed because he was ashamed of deeds done when he was younger. I shied away from mentioning the nature of his deeds and identifying him other than by his forename in my article for the Border Telegraph because it is a family newspaper - I would not want his descendants, some of whom might be school children, bullied, ostracised, traumatised because of what their ancestor did. However, was that the correct decision ? Is it worse to have an ancestor that was transported to Australia for stealing a purse, than to have one that was jailed for poaching or assault ? Lastly, there are also a lot of websites that list people with criminal or lunatic pasts, for example, Black Sheep Ancestors and London Lives 1690-1820. Should such sites be allowed ? If you have any comments, please let me know by clicking the 'comments' link below. The English National Archives recently launched a new Legislation website, www.legislation.gov.uk. Their news page says it gives "clearer, faster and easier access to legislation, from Magna Carta to the latest statutory instruments. ... you can find details of everything on the statute book, in one place and free of charge." It goes on to say that "Containing a massive 6.5 million PDF documents, the new website shows both the original version of any piece of UK legislation covering all jurisdictions (England, Scotland, Wales and Northern Ireland) and details of any amendments, so that those accessing it can see how laws have evolved." That would be a marvellous achievement, but the reality falls a bit shy of the mark. There is a lot of historical legislation, including many Acts of the Scottish Parliament, on the site, but I found some gaps, and I'm sure there are other missing acts too. For example, I couldn't find the Scottish Parliament's Act of 1579 'An Act For Punischment of Strang and Idle Beggars, and Reliefe of the Pure and Impotent' or a related act of 1597, or the very important 'An Act for the Amendment and better Administration of the Laws relating to the Relief of the Poor in Scotland' of 1845, or indeed the Savings Bank act of 1835. There other acts I would like to see, but I can't find them without knowing the titles. Dawn Dean, the Contracts Delivery Manager, in response to my email enquiry, said that the website carries all legislation from 1988 onwards. It also has a selection of earlier, Primary Legislation (i.e. Acts) where such legislation was available in a web-publishable format, however the site is not a comprehensive source of every Statute ever enacted. She also said that they are monitoring demand for legislation they don't hold on the site with a view to including some of the most requested Acts at a later date. However, what there is, is still very useful. A notable lack is a keyword search in the content of the acts, however this can be done by Google. and found that there were 4 items of interest to me.